If you need to fish those mid-river runs, or just want a capable watercraft that can still break-down small enough to fit in your vehicle, pontoon boats have a lot to offer. Choosing the best fly fishing pontoon boat can bring a heap of beneficial features to your fishing adventures. Even small pontoon boats are remarkably stable watercraft and many are rated for moving water. The design of pontoon boats vary from simple boats that are just a step above a float tube, to boats with full casting platforms, lean bars, and motor mounts. That’s why Fly Fishing Atlas brings you our review of the best pontoon boats for fishing. Which options will provide for your fishing needs will depend on how you want to use your pontoon boat. The added capability of a pontoon boat can open up new water to fish that is completely inaccessible by other anglers. We cover the details and explore the strengths and weaknesses so you can make an informed decision. The Colorado from Classic Accessories has withstood the test of time like few others. Now the newest Colorado model, the XTS, has set a new standard for cost effective framed pontoon boats. Meeting at the perfect crossroads of durability, affordability, and capability, this boat is made to impress. This boat features rugged pontoons with abrasion resistant PVC bottoms that measure in at 9 feet long. Overall the boat is 56 inches wide, and is absolutely loaded with great features that make for a fantastic day on the water. Framed pontoon boats can sometimes present challenges when it comes time to transport from one place to another if you don’t have a pickup truck. Classic Accessories eliminated that by making the powder coated steel frame in separate sections that are held together by D-clips. So when its time to travel the frame breaks down and reassembles really fast. The same D-clips that pin the frame together also allow a wide range of adjustment settings for anglers that might be taller or have longer legs. Comfortable seating is always important during long days on the water. The padded swivel seat is supportive and allows for ample adjustment by sliding front to back and locking in place wherever you need. For easier transport, the seat back also folds down. There are a number of choices on how you will be getting around in the Colorado XTS. You can wear fins and propel this boat like other kick boats. You can also use the 7 foot aluminum oars that lock in 3 different positions to row when needed. And you can also attach a motor on the included two-position motor mount and cruise to your location. Storage isn’t going to be an issue with this boat either. On each side of the seat there are two areas for very spacious gear bags that come standard with the boat. They attach to the pontoon with hook and loop patches, and can be pulled off and hooked together to form a gear duffel bag. Two additional fixed pockets are located toward the back of each pontoon. To keep your fly line from drifting and possibly tangling with debris in the water, the Colorado XTS comes with a great stripping basket as well as an under-seat apron. The stripping basket can be hooked on either side of the seat in place of one of the gear bags, or worn across your lap as pictured below. As should be expected, Classic Accessories put a lot of thought into accessorizing the Colorado XTS. This pontoon boat is quite decked-out. The boat comes standard with a two-position anchor system, cord and pulley, and a fillable mesh bag for a simple and lightweight anchor. You’ll also receive a rod holder that can be mounted in six different positions. We really like the stowable transport wheel to keep the boat up and away from sharp objects when moving between your vehicle and the water. Another great feature we like is the basket behind the seat and the purpose-made battery platform. Buyers rave about the versatility of this pontoon boat. 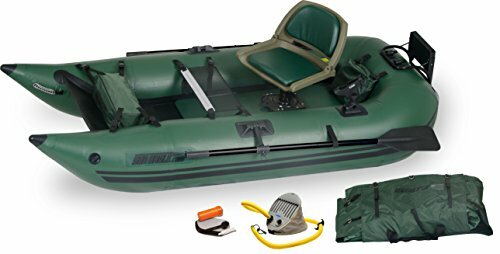 Reviewers frequently use the boat as a multi-purpose replacement for drift boats, river rafts, or float tubes and kick boats. They also enjoy the tremendous storage space and weight capacity. Even with a trolling motor and battery in the rear basket, the boat can carry plenty of additional gear with room to spare. Like most personal pontoon boats, this boat isn’t designed for standing. If not being able to stand is a deal-breaker for you then take a look at our other options below. Our recommendation is to choose this boat if you are in need of a capable and maneuverable pontoon boat. You’re unlikely to find a similar pontoon boat at this price with this level of features. And the proven reputation of the Colorado line is a strong testimony to the durability and popularity of this watercraft. If you need a pontoon boat that is ready to rock in big water then the Fish Cat 13 from Outcast is up for the challenge. You can fish with confidence and comfort with all the features and capability needed for serious river use. With a 750 pound capacity and enough room to carry a pile of gear, this is a solid pontoon boat that can host one or two anglers. The Outcast Fish Cat 13 is named according to its 13 foot length, which makes for a versatile and capable watercraft. Being able to stand when needed is a huge advantage, and the lightweight aluminum frame includes a front standing platform and an optional rowers platform. 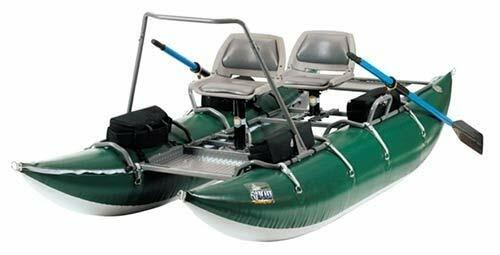 And the removable front mod transforms the boat into a single-person expedition raft. Every angler loves a comfortable seat and this boat delivers with good padding and great support for your back. The seat swivel also allows you to easily cast in any direction. But if you do decide to stand then the front lean bar is there to help keep your balance. The Fish Cat 13 features 20 inch pontoons that keep the boat very steady and balanced, but at 65 inches wide it is also great for slipping through those tight passes and narrow trout-filled runs. The width is well suited for quick paddling while still offering great stability in rough conditions. For gear mounting options the Fish Cat 13 comes standard with four gear bags that attach to the frame on both sides of each seat. A large storage deck is also included at the rear of the boat for larger bags and gear items that can be stored out of the way. Overnight trips are easily accommodated. Durability is always a standard feature of Outcast products and the Fish Cat 13 carries on the tradition. The Vinyl Airecells are covered by super rugged 1000 denier PVC skins with stitched seams and zippered access. Summit 2 valves make for quick inflation and deflation. Also included with the Fish Cat 13 pontoon boat is the 11-piece aluminum frame, an anchor system, and 2 eight-foot two-piece oars. Seats, lean bar, and gear bags are standard as well. A few optional items you might find necessary are a motor mount or a rowers casting platform. Buyers point to this pontoon boat as an effective and economic alternative to drift boats and river rafts. 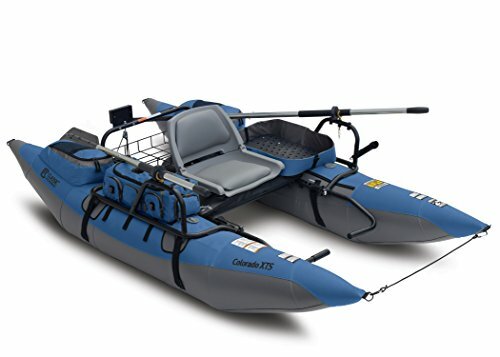 Even though it is heavy when assembled, reviewers say the boat assembles and disassembles quickly for easier transport and quick setup when you reach the destination. If you need to make precise casts then the ability to comfortably stand and cast is a game changer. This boat’s modular design and it’s ability to adapt to one or two anglers is a big plus. There isn’t much about this pontoon boat that we can pick apart. Whether you want to drift it, row it, or mount a motor, it will perform well in a variety of circumstances. Length x Width: 13' x 65"
Weight: 170 lbs. Load Capacity: 750 lbs. Remove the front frame module for a great one-person expedition raft. The Outcast Stealth Pro carries with it all the reputation and quality that has come to be synonymous with the Outcast line of watercraft. This is a smaller pontoon-style boat, but don’t let that fool you. The Stealth Pro is a capable boat that can go where larger boats cannot. This frameless pontoon style boat measures in at 8 feet long and 5 feet wide. That stable footprint combines with this boat’s rockered ends to make this boat ready to take on big water, whether moving or still. With no frame to assemble, or disassemble, the Stealth Pro makes it easy to just inflate and go. The mobile size also makes this boat easier to transport to locations where other boats cannot go. And when you get there the fast filling recessed Summit 2 valve makes the Stealth Pro easy to inflate and deflate. You can use fins to propel the boat like a float tube, or put your feet on the foot bar and grab the oars to powerfully move through the water. The Stealth pro gives a nice high ride so if you use fins you’ll only have your lower leg in the water. For all your gear carrying needs, the Stealth Pro comes with an Integrated Gear System (IGS) which is designed around purpose-made sleeves that can hold Scotty Mount bases. The IGS attachments are perfect for mounting rod holders, fish finders, or anchor mounts. Outcast strategically placed an IGS mount on the back of the boat which perfectly places an anchor mount for making stops in moving or still water. This pontoon boat is designed for fishing while remaining seated, so Outcast made sure to design the seat in the Stealth Pro with comfort in mind. The seat back is supportive and adjustable so you can find the right position for your posture. And for taller folks who might have long legs and need to stretch out, the seat can be positioned wherever you’d like with pull straps that are easy to adjust. With over 16 inch diameter rugged pontoons that hold high-quality Aire chambers, you can rest easy knowing your pontoon boat is dependable and covered by a 5 year warranty. In the shipping package you’ll find the Stealth Pro along with the world-renowned Outcast stripping apron. Also included is a foot bar, 2 oars, and one frameless gear pocket which attaches with an IGS mounting plate wherever you should choose. Outcast also includes a repair kit with the Stealth Pro as well as an extra oar pin just in case you happen to lose one. Buyers love the lightweight nature of the boat over the framed pontoon boats. The quick setup and break down is also a feature that gets mentioned. Reviewers also frequently mention the high ride and small storage requirements of the Stealth Pro. You won’t be standing in the boat unless you have some ninja-like balance. So if you want a boat designed for standing then you should look at some of our other options below. We want to clearly point out that this boat is likely not designed for whitewater. With that said, reviewers report taking this boat through multiple class III rapids and even a class IV. Though we don’t recommend doing that, it does speak to the capability of the boat. The Sea Eagle 285 Pro package wonderfully integrates portability and capability. This frameless pontoon boat can be transported and stored in very small spaces because there is no frame to break-down. 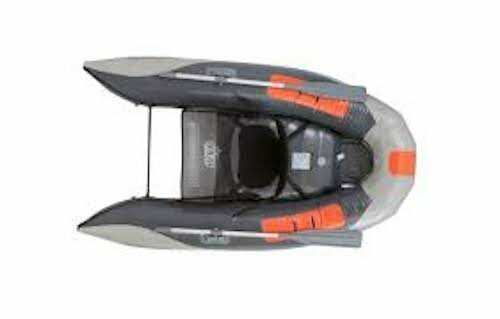 The boat has robust stability which provides for comfortable and useful features that you are unlikely to find in other boats in this price range. The ability to stand, comfortable swivel seating, and a motor mount are just a few of the highlights. Storage for fishing gear is nicely accommodated with ample space and a 450 pound weight capacity. This pontoon boat is well suited for still water lakes and ponds, but also excellent for moving rivers, bays, and creeks. Skinny water won’t be a problem either. With a 9ft x 4ft configuration and large 16 inch pontoons, this boat can carry a lot of weight while still only drafting 4 inches of water. Fully outfitted with motor mount and floorboard, the Sea Eagle 285 Pro weighs in at only 42 pounds. You can remove these features if you want a lightweight package for accessing remote areas, which further reduces the weight to only 30 pounds. But if you like to stand then you’ll definitely want to have the floorboard installed to make fishing on your feet much more stable. Of course a comfortable seat is important if you want to put in a full day on the water, and this boat delivers nicely in that regard. The seat swivel also allows you to turn slightly to comfortably run a motor or cast in any direction. This is really a versatile boat that can be rigged in many ways with many fishing accessories. The Sea Eagle 285 Pro comes with two universal Scotty Mounts plus 2 Scotty Rod Holders. Scotty mounts can hold accessories like fish finders and anchor mounts as well, but you can also attach Scotty mounts to the floorboard to hold whatever additional accessories you need. For tackle and other gear the package includes a clip on stow pouch and a side/stern bag. Standard features and accessories included with the Sea Eagle 285 Pro Package are the boat carry bag, oar set, foot pump, floorboard, 2 stow bags, and motor mount. And if you are looking for the perfect motor for this boat we have found the Honda Marine BF 2.3 HP and the Minn Kota Endura C2 30 to pair very nicely with this boat. Buyers say the Sea Eagle 285 is a lot fun on the water, stable and easy to move around in water or on land. Reviews consistently mention that the boat set up is quick, functional, and easy to accomplish. The quality and strength of materials used in construction is also frequently mentioned. There just aren’t many inflatable boats in this price range with these features and capabilities. The ability to comfortably stand while casting is always nice. But the ability to also mount a motor or use oars is a pretty unique combination. Add in the storage and stability aspects and you are looking at a pretty special boat. Exterior: 9' x 4' / Interior: 6'2"x1'4" / Deflated: 24"x14"x12" / Tube Diameter: 16"
Weight: 30 lbs. (hull only) 42 lbs. (with floorboard and motormount) / Load Capacity: 1 person or 450 lbs.